They are an integral part of complex inter-relationships that are not always obvious at my human eye level. I catch glimpses of some of these sometimes while I walk in the fields and woods, or when I garden. It makes me realize how much I don’t know about the intricate network of relationships between plants, animals, and microorganisms that are going on around me all the time. Over the past several months I have noticed, and have had questions about, structures that I have found on fiber and dyeplants. I thought I’d share some of what I’ve been learning. First, let’s consider goldenrod. The kind I have used for dyeing is Solidago canadensis, I believe. I didn’t end up running any dyebaths with goldenrod this summer. Nevertheless, all summer I kept a close eye on it while it budded, bloomed, and went to seed. 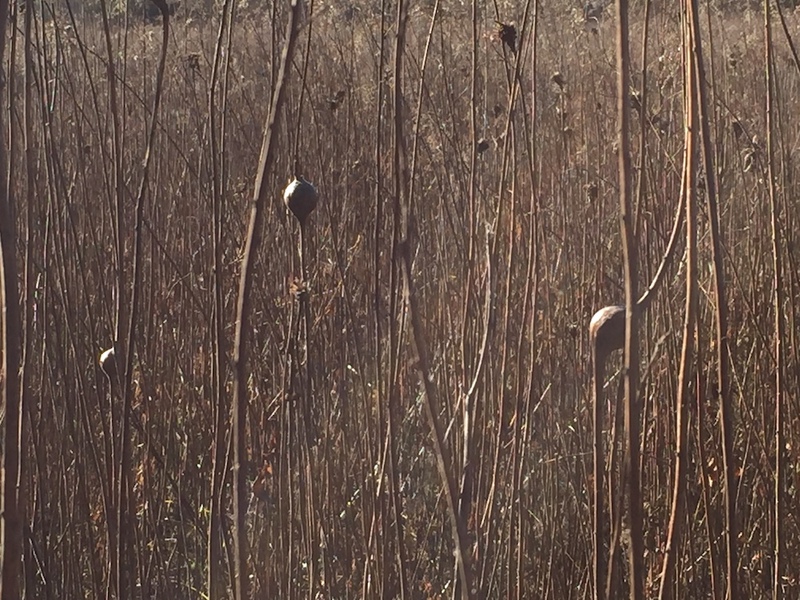 In the late fall, the stalks had dried and become woody. The structure of the galls on the stems was clearly visible. 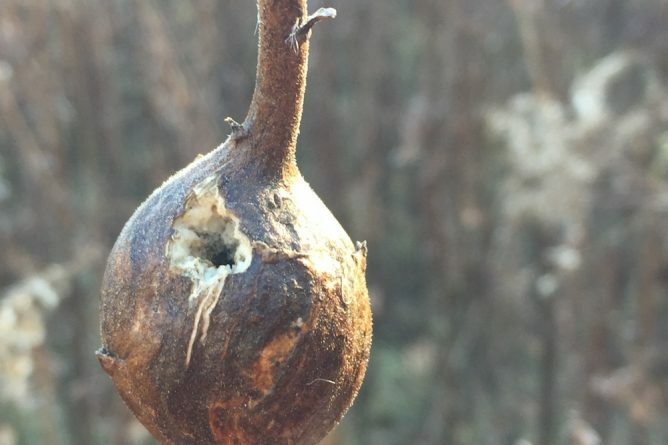 Generally speaking, galls work like this: an insect lays an egg on a plant, and some kind of irritation or stimulation causes the plant cells to swell up around it. The swelling makes a cozy home for the baby bug while it grows and develops. Eventually, the adult bug emerges and continues its buggy lifecycle. 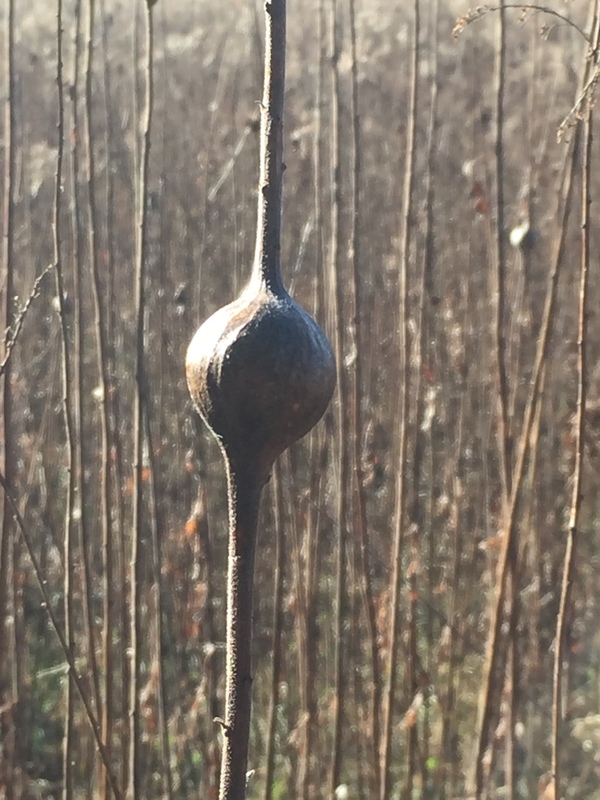 The galls I photographed are, I believe, goldenrod ball galls. I identified them using two excellent resources at my school‘s library, Naturally Curious by Mary Holland and Entomology by Ellen Doris. For on-line resources, the University of Wisconsin Extension Master Gardener page and this Nature North page were very helpful. 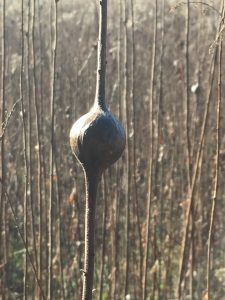 Here are some more details about goldenrod ball galls. Goldenrod ball galls are made by the goldenrod ball gall fly, Eurosta solidaginis. The adults are teeny little things, about 5 mm long, which makes me feel better about the fact that I’ve never noticed one. In the late spring, the female fly lays eggs in the leaf bud at the tip of the stem. As soon as it hatches, the larvae drills into the bud and starts feeding. In response to the chewing, or perhaps the secretions of the larva, the goldenrod stem thickens. The larva eats the juicy and nutritious tissue inside the gall as it grows, and makes a little chamber for itself inside. It takes 3 or 4 weeks for the gall to fully form. The larvae molt a couple times through the summer and fall. Each stage of larval development is called an “instar” which sounds sort of magical. The third-stage larva is able to survive the winter by producing glycerol and sorbitol, which prevent its cells from damage by freezing. The third instar goes into a kind of hibernation called diapause all winter. In the spring, the larva chews an escape tunnel through the fibers of the gall, stopping just before the outermost skin of the gall. Once it has fully metamorphosed, the adult fly doesn’t have any mouth parts. Insects plan ahead! The adult fly crawls out through the tunnel that it dug for itself earlier, then pops through the outer layer of the gall by inflating part of its head. The adult flies only live for a couple weeks, without eating. During this time they mate and lay eggs. 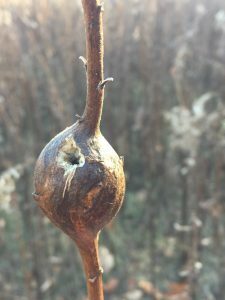 They do not travel far from where they are born, which is why there are often a large number of galls in a small area. The females use chemical sensors on their feet and antennae to make sure they are laying eggs on the right goldenrod species. The exit hole is very small when the adult fly emerges. The ones that I found had holes of various sizes. Some of them had large holes that looked like they had been chipped away. It turns out that downy woodpeckers and black-capped chickadees can detect the larvae inside the gall and dig them out to eat. The woodpeckers make a neat hole, but the chickadees have to chip away with their smaller beaks, so the holes they make are messier.